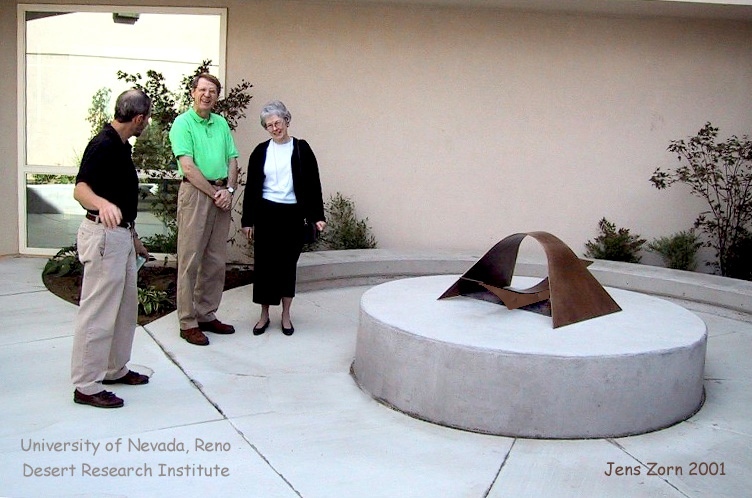 installed June 2002 at the University of Nevada, Reno. Over the years 1974-1996 the Scientific Laboratory of the Ford Motor Company and later the Desert Research Institute of the University of Nevada supported measurements of the air quality in highway tunnels. Designed and led by William Roy Pierson (1930-2000), these experiments captured traffic emissions inside the tunnel while tracking the actual numbers of cars and trucks as well as the nature of the air flowing through. This accommodated the variability of real-world vehicle performance—factors such as vehicle age, operating condition, and driver behavior—and the results, with their high degree of scientific validity, have influenced much of the recently-written air quality legislation. The representation, that of air flowing through a tunnel, celebrates Pierson’s internationally famous work. The title for the sculpture, “That we might breathe the air — That we might sing the songs”, recognizes Pierson both as an environmentalist and as a musician whose talent and enthusiasm was not only for the music itself, but also for bringing that music in an inclusive manner to persons of all descriptions.